To travel to Russia, you need a visa (like Russian people need in order to go through the countries of European Union, United States and some others, so before the trip they should process the Visa at the Consulate of the country they want to visit). The visa for incoming Russia is processed by the Russian consulate in your country (usually in the country's capital or major cities), before making the trip. Some travel agencies make as intermediaries with the Consulate. The most frequent and easy visa available is the tourist visa (with a maximum stay of one month). 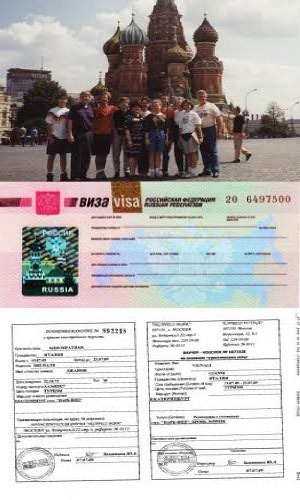 To obtain the visa, you must go to the Consulate of Russia in your country or the travel agency that makes an intermediary with the following things: your Passport, one photo, a medical assurance and a document of the Russian side which confirms the booking of the lodging (known as "Visa Support" or as "Letter of invitation" or as "Voucher"). This document can also be call "support by the visa", "tourist bonus", "confirmation of lodging". The Visa is always the same standard document, which consists of two parts: (Part One) a "bonus services" = "voucher" (in Russian it is equal) and (Part Two) a "confirmation of welcome of foreign tourists"="reservation confirmation" = "podtverzhdenie" (in Russian). This document is issue by a Russian travel agency authorized by the Ministry of Foreign Affairs of Russia for its emission or also a hotel with the governmental permission could do it. In most of the cases this document is managed when you book your lodging in Russia (but is not automatic process), so when you book your hotel dont forget to ask about this (ask for the "visa support"). There are also travel agencies or agents of visa that offer this kind of service. The visa is it will be given exactly for the dates of stay indicated in the letter of invitation. Note that is not usually required, your plane or train tickets to apply for the visa. The visa will be on a page of your Passport. The people of Argentina, Chile, Colombia, Venezuela, Israel, and Brazil not need visas to go into Russia, and also people of Russia don't need Visa to travel to these countries. In any case, it is desirable to consult with a Russian consulate in your country or to the Consulate of your country in Russia before you travel. When you have the visa, you can travel to any city of Russia and stay in any place, although this was not specified in the questionnaire of the visa and invitation / visa support. Yes is important for you, to register the visa if you are more than 3 working days in a city, but if you are in a standard hotel, they make the registration for you. The tourist visa is not extendable so be aware about this. Therefore, if you are not completely sure of the dates of entry and exit of Russia, obtain the visa with broader dates for more flexibility (for example one month). It is important to enter and exit the country during the period of its validity. They don't matter from where you are entering (from which country) and the transport (bus, plane, train). The registration of the visa (it is an advice of the migration service) is mandatory if you are in Russia or in one city more than 3 working days. As we mention, if you're in a hotel, they will take care about this. If you not stay in a hotel and you will stay more than 3 working days, before the trip, tell this to the agency that made the "invitation" or "visa support" if they can register the visa in the cities where you are going to be. Some serious agencies are responsible for this, but if the Agency does not provides this service, then, you can register the visa yourself at the OVIR offices or at the post office with the help of your Russian contacts that gave you accommodation. You must ask about this to the person or agency which make the invitation before the trip details.